The author, SitePoint’s own Stuart Langridge, utilizes Web standards, and separates code from markup as he constructs compelling, usable and interactive DHTML applications that degrade gracefully. This book provides countless applications of DHTML that will improve your site’s interactivity in browsers that support standards, and degrade gracefully in those that don’t. These first four chapters should give you a taste of the action. To find out more about the book, visit the book’s page, or review the contents of the entire publication. As always, you can download this excerpt as a PDF if you prefer. And now, to Chapter 1. Websites are written in HTML. If you’re reading this book, you’ll almost certainly know what HTML is and will probably be at least somewhat experienced with it. For a successful DHTML-enhanced Website, it’s critical that your HTML is two things: valid and semantic. These needs may necessitate a shift away from your previous experiences writing HTML. They may also require a different approach than having your preferred tools write HTML for you. A specific set of rules, set out in the HTML recommendation, dictate how HTML should be written. HTML that complies with these rules is said to be "valid." Your HTML needs to be valid so that it can be used as a foundation on which you can build DHTML enhancements. While the set of rules is pretty complex, you can ensure that your HTML is valid by following a few simple guidelines. Here is some <strong>bold and <em>italic</strong> text</em>. Here, the <strong> and <em> tags cross over one another; they’re incorrectly nested. Nesting is extremely important for the proper use of DHTML. In later chapters of this book, we’ll study the DOM tree, and the reasons why incorrect nesting causes problems will become clear. For now, simply remember that if you cross your tags, each browser will interpret your code in a different way, according to different rules (rather than according to the standard). Any hope of your being able to control the appearance and functionality of your pages across browsers goes right out the window unless you do this right. Tags such as <strong> or <p>, which contain other items, should always be closed with </strong> or </p>, or the appropriate closing tag. It’s important to know which tags contain things (e.g. text or other tags) and to make sure you close them. <p>, for example, doesn’t mean "put a paragraph break here," but "a paragraph begins here," and should be paired with </p>, "this paragraph ends here." (Those who know what they’re doing with container tags will be aware that HTML 4.01 does not actually require that all container tags are closed (though XHTML still does). However, it’s never invalid to close a container tag, though it is sometimes invalid to not do so. It’s considerably easier to just close everything than it is to remember which tags you’re allowed to leave open.) The same logic applies to <li> tags as well. That information can be typed on a single line, or with a line break after EN". Don’t worry, for the moment, about what this means: just be sure to place it at the top of every page. The article Fix Your Site With the Right DOCTYPE!, published on A List Apart, lists all the DOCTYPEs you might want to use, and why you’d need to use them at all. I visit that article all the time to cut and paste the one I need! The most important page creation step is to check that your HTML is valid. There are numerous tools that you can download and run on your own computer to test your code’s validity – some HTML editors even have such tools built in – or you can use one of the many online validators, the most common of which is the W3C’s own validator. A validator will tell you how you need to adjust your HTML in order to make it compatible with DHTML techniques. The ultimate reference for what constitutes valid HTML is the HTML recommendation. It’s complex and detailed, but if you have any questions about how HTML should be written, or whether a tag really exists, you’ll find the answers there. 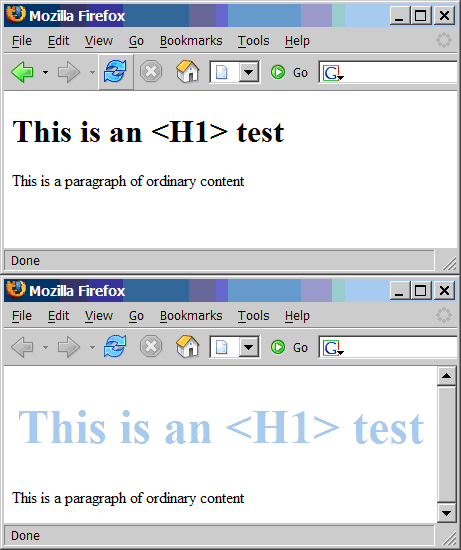 As mentioned above, browsers rely on a standard that describes how validated HTML should be interpreted. However, there are no standards to describe how invalid HTML should be interpreted; each browser maker has established their own rules to fill that gap. Trying to understand each of these rules would be difficult and laborious, and you have better things to do with your time. Sticking to valid HTML means that any problems you find are deemed to be bugs in that browser – bugs that you may be able to work around. Thus, using valid HTML gives you more time to spend with your family, play snooker, etc. which, if you ask me, is a good reason to do it. In addition to its validity, your HTML should be semantic, not presentational. What this means is that you should use HTML tags to describe the nature of an element in your document, rather than the appearance of that element. So don’t use a <p> tag if you mean, "put a blank line here." Use it to mean, "a paragraph begins here" (and place a </p> at the end of that paragraph). Don’t use <blockquote> to mean, "indent this next bit of text." Use it to mean, "this block is a quotation." If you mark up your HTML in this way, you’ll find it much easier to apply DHTML techniques to it further down the line. This approach is called semantic markup – a fancy way of saying, "uses tags to describe meaning." You’ll find yourself using the <ul> tag a lot. Many of the items within a Website are really lists: a breadcrumb trail is a list of links, a menu structure is a list of lists of links, and a photo gallery is a list of images. Remember: the way your page looks isn’t really relevant. The important part is that the information in the page is marked up in a way that describes what it is. There are lots of tags in HTML; don’t think of them as a way to lay out information on your page, but as a means to define what that information means. If you don’t use HTML to control the presentation of your pages, how can you make them look the way you want them to? That’s where Cascading Style Sheets come in. Cascading Style Sheets (CSS) is a technique that allows you to describe the presentation of your HTML. In essence, it allows you to state how you want each element on your page to look. An element is a piece of HTML that represents one thing: one paragraph, one heading, one image, one list. Elements usually correspond to a particular tag and its content. When CSS styles are used, DHTML pages can work on the appearance and the content of the page independently. That’s a handy and clean separation. If you want to look good, you need to learn how to dress up and go to the gym regularly! See the section called "Further Reading" at the end of this chapter for some links to introductory tutorials on CSS, which should help if the above lines don’t make a lot of sense to you. Figure 1.1. That HTML’s stylin’! The key point here is to remove the presentation aspects from your HTML and put them into your style sheet. If , for example, you made your page heading bigger by putting <font> tags in your HTML, then you’d need to paste those tags into every page on which a header was used. By making your HTML semantic and moving the page’s presentation into CSS, you can control the look of headings across the whole site through a single style sheet. This makes your job as Website developer much easier. Of course, it’s not quite as easy as that. Although the full definition of CSS allows you to do some fairly amazing things, and to control the presentation of your pages to a high degree, not every browser supports everything that CSS has to offer. In order to know about the differences in browser support for CSS, you need to know what CSS can do. There are two sorts of browser incompatibilities: things that a given browser doesn’t implement, and things that it implements incorrectly. Occasionally, browsers add their own "special features" as well, but we won’t be worried about those in this book. Missing implementations are relatively easy to deal with: don’t rely on such rules if you want your CSS to work in browsers that have failed to implement them. This can be a pain, especially since the most commonly used browser in the world, Internet Explorer for Windows, has some serious holes in its CSS support; however, this "solution" is often a necessary compromise. Learning which rules you can and can’t use is one of the steps on the path to CSS guru-hood. Badly implemented standards are a bigger problem. In such cases, the browser gets it wrong. Another step to CSS guru-hood is understanding exactly what each browser does wrong, and how you can work around those failings. You don’t need that knowledge to start with, though: you’ll pick it up as you go along. Workarounds for CSS bugs in different browsers are usually achieved using CSS hacks. These hacks take advantage of the bugs in a browser’s CSS parser to deliver it specific style sheet directives that work around its poor implementation of the standards. A huge variety of these CSS hacks is documented for each browser in various places around the Web; see the section called "Further Reading" for more. Learning to understand and adapt to the vagaries of CSS handling in various browsers is part of the work that’s required to use CSS effectively. While it can be a lot of work, many CSS bugs only become apparent with the complex use of this technology; most CSS is handled perfectly across platforms and browsers without the need for hacks or complex tests. The first function does the work of converting the text. The second function makes sure that the first is connected to the right HTML tag. The final line performs this connection once the page has loaded in full. Although this means more code, notice how it keeps the HTML content clean and simple. In future chapters, we’ll explore this kind of approach a lot. Don’t worry about the mechanics too much for now – there’s plenty of time for that! Try these links if you’re hungry for more on CSS itself. SitePoint’s easy introduction to the world of CSS is a great place to start. W3Schools’ CSS tutorials are helpful whether you’re learning, or simply brushing up on your knowledge of CSS. The CSS Zen Garden is a marvelous demonstration of the power of Cascading Style Sheets alone. It has a real wow factor! This comprehensive list of CSS hacks shows you which browsers will be affected by a given hack, if you need to hide certain CSS directives (or deliver certain directives) to a particular browser. This site demonstrates CSS issues in various browsers and explains how to work around them. The CSS-Discuss mailing list is "devoted to talking about CSS and ways to use it in the real world; in other words, practical uses and applications." The associated wiki is a repository of useful tips and tricks. If you’re after something more definitive, SitePoint’s book, HTML Utopia: Designing Without Tables Using CSS is a complete guide and reference for the CSS beginner. The CSS Anthology: 101 Tips, Tricks & Hacks is a perfect choice if you prefer to learn by doing. Peter-Paul Koch’s list of JS techniques and scripts covers a considerable amount of ground in this area. will give rise to dom! …the phrase itself was just so striking! Utterly meaningless, but it looks like what… a warning? What is "dom?" According to the World Wide Web Consortium, "the Document Object Model is a platform- and language-neutral interface that will allow programs and scripts to dynamically access and update the content, structure and style of documents. The document can be further processed and the results of that processing can be incorporated back into the presented page." This statement basically says that the DOM is not just a novelty – it is useful for doing things. In the coming pages, we’ll take a brief look at the history of the DOM before investigating more deeply what it is and how we can use it. We’ll finish up with some example scripts that demonstrate the power of this critical aspect of DHTML. By version 4, the two browsers had diverged significantly in terms of their respective feature sets and the access they provided to page content. Each browser manufacturer implemented its own proprietary means of providing scripting access to layers. Scripts that wanted to work in both browsers needed to contain code for each method. The ill-fated "browser wars" were all about these proprietary extensions to the Web, as each manufacturer strove to attract more developers to its platform through the lure of new features. There was little regard for cross-browser compatibility, although Microsoft copied and supported most of the early innovations made by Netscape. While all this was taking place, the W3C developed a specification for the Document Object Model Level 1, which outlined a generic and standard method to access the various parts of an XML document using script. Since HTML can be thought of as a dialect of XML, the DOM Level 1 spec applied to HTML as well. Both major browser manufacturers implemented the DOM Level 1 specification: in Internet Explorer 5 and in Netscape 6. The previously existing proprietary specifications were retrospectively titled; since the new standard was DOM Level 1, those old and now deprecated methods were called DOM Level 0. (Since then, the W3C has also released the DOM Level 2 and DOM Level 3 specifications, which add more features and are broken into separate modules.) There’s no formal DOM Level 0 standard, though. So, you know what the DOM used to be. Now let’s discuss what it is. I added lots of extra indenting so that you can compare this snippet with the matching DOM tree. Don’t do that in real life – I’m just trying to make things clearer in this case. The matching DOM tree is shown in Figure 2.1. Notice that the nesting level of each tag in the HTML markup matches the number of lines it takes to reach the same item in the DOM tree. For example, the <a> tag is nested twice inside other tags (the <p> and <body> tags), so the a node in the tree is located two lines from the top. Figure 2.1. 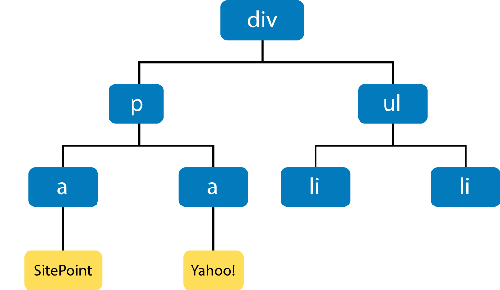 An example of a DOM tree. <strong>These <em>elements are</strong> badly nested</em>. The DOM tree that results from this incorrectly nested code won’t be a tree at all: it would need to be malformed in order to express the invalid element layout that this HTML requests. Each browser fixes malformed content in a different way, which can generate such horrors as an element that is its own parent node. Keeping your HTML valid avoids all these problems. This process is known as recursion, and is defined as the use of a function that calls itself. Each child is the same type of thing as the parent and can therefore be handled in the same way. We don’t do much with recursion ourselves, but we rely quite heavily on the browser recursing through the page’s tree. It’s especially useful when it comes time to work with events, as we’ll see in Chapter 3, Handling DOM Events. There are two principal methods that can be used to get a particular element or set of elements. The first method, which is used all the time in DHTML programming, is getElementById. The second is getElementsByTagName. Another method, getElementsByName, is rarely used, so we’ll look at the first two only for now. Now the variable sitepoint_link contains a reference to the first <a> tag in the above HTML snippet. We’ll see a little later what you can do with that element reference. The DOM tree for this snippet of HTML is depicted in Figure 2.2. Figure 2.2. 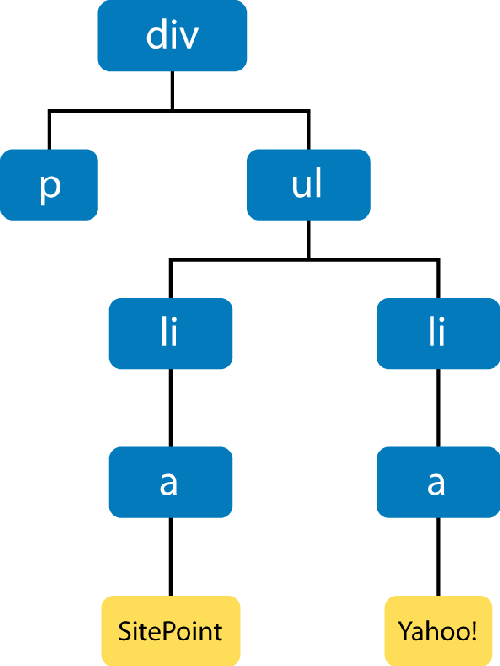 The snippet’s DOM tree. The all_links variable contains an array, which contains two elements: a reference to the SitePoint link, and a reference to the Yahoo! link. The elements are returned in the order in which they are found in the HTML, so all_links is the SitePoint link and all_links is the Yahoo! link. Note that "Element" is plural in this method’s name, but singular for getElementById. This is a reminder that the former returns an array of elements, while the latter returns only a single element. Each node has one parent (except the root element) and may have multiple children. You can obtain a reference to a node’s parent from its parentNode property; a node’s children are found in the node’s childNodes property, which is an array. The childNodes array may contain nothing if the node has no children (such nodes are called leaf nodes). We’ll see all these properties used routinely through the rest of this book. The two most useful references that document elements and their supported attributes are those provided by the two major browser makers: the Microsoft DOM reference, and the Mozilla Foundation’s DOM reference. Importantly, though, when we altered our link’s href above, all we changed was the destination for the link. The text of the link, which read "SitePoint" before, has not changed; if we need to alter that, we have to do so separately. 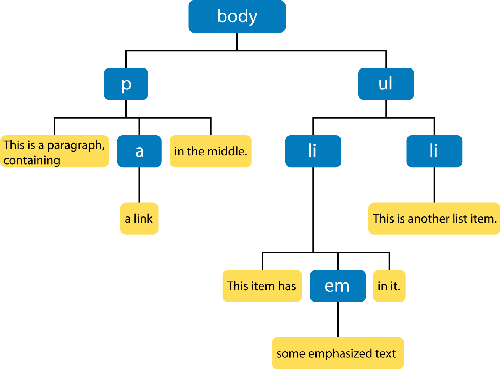 Changing the text in a page is slightly more complex than changing an attribute; to alter text, you need to understand the concept of text nodes. For a complete reference to the available CSS style properties and what each does, see SitePoint’s HTML Utopia: Designing Without Tables Using CSS. The next level of DOM manipulation, above and beyond changing the properties of elements that are already there, is to add and remove elements dynamically. Being able to change the display properties of existing elements, and to read and alter the attributes of those elements, puts a lot of power at your disposal, but the ability to dynamically create or remove parts of a page requires us to leverage a whole new set of techniques. Figure 2.3 shows the new DOM tree so far. Figure 2.3. The DOM tree after changes. Be sure that the second argument (sitepoint_link) really is an existing child node of para, or this method will fail. Even after the node’s removal, sitepoint_link still constitutes a reference to that link. It still exists, it’s just not in the document any more: it’s floating in limbo. We can add it back to the document somewhere else if we want to. Set the variable to null to make the deleted element disappear forever. Moving existing elements around within the page is a powerful and useful technique (with which you’re well on the way to implementing Space Invaders or Pac Man!). But, above and beyond that, we have the ability to create brand new elements and add them to the page, providing the capacity for truly dynamic content. The point to remember is that, as before, a page’s text resides in text nodes, so if we need to create an element that contains text, we must create both the new element node and a text node to contain its text. To achieve this, we need two new methods: document.createElement and document.createTextNode. As you can see, to create elements, we use the same techniques and knowledge – text nodes are children of the element node, we append a child with node.appendChild – we use to work with nodes that are already part of the document. To the DOM, a node is a node whether it’s part of the document or not: it’s just a node object. You can’t rush ahead and just do this, though: it pays to be careful with cloneNode. This method clones all attributes of the node and all its child nodes, including IDs, and IDs must be unique within your document. So, if you have elements with IDs in your cloned HTML block, you need to fix those IDs before you append the cloned block to the document. As you can see, there’s a little bit of surgery involved if you choose to copy big chunks of the document. This demonstration concludes our experimentation with this particular bit of code. As our first full example, we’ll use the DOM’s element creation methods to build a form that can grow as the user fills it. 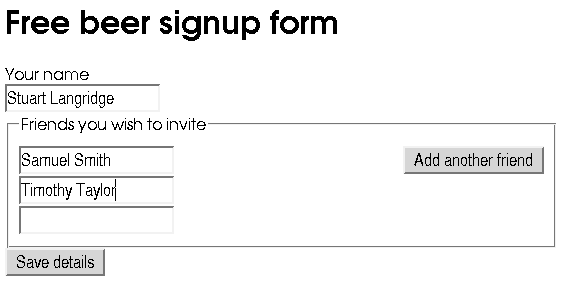 This allows users to add to the form as many entries as they like. The users add their own names, then the names of all of the friends they wish to invite. Without the DOM, we’d require the form either to contain a large number of slots for friends’ names (more than anyone would use), or to submit regularly back to the server to get a fresh (empty) list of name entry areas. Our form will provide a text entry box for the user’s name, a fieldset containing one text entry box for a friend’s name, and a button to add more friends. When the button is clicked, we’ll add a new text entry box for another friend’s name. Notice our fieldCount variable; this keeps track of how many friend fields there are. Figure 2.4. Signing up for free beer. Free beer, thanks to the power of the DOM. We can’t complain about that! We’ll build our page so that the links on which we want to display rollover effects have a class of rollover. They’ll contain one img element – nothing else. We’ll also provide specially named rollover images: if an image within the page is called foo.gif, then the matching rollover image will be named foo_over.gif. When the page loads, we’ll walk the DOM tree, identify all the appropriate links (by checking their class and whether they contain an img element), and set up the rollover on each. This specially-named rollover image allows us to deduce the name of any rollover image without saving that name anywhere. It reduces the amount of data we have to manage. However, since oversrc isn’t a standard attribute, this approach would cause your HTML to be invalid. Some of the following script may seem a little opaque: we will be attaching listeners to DOM events to ensure that scripts are run at the appropriate times. If this is confusing, then feel free to revisit this example after you’ve read the discussion of DOM events in the next chapter. First, the HTML: here we have our links, with class rollover, containing the images. // Make it point to "something_over.ext"
// Make it point to "something.ext"
The DOM-walking parts of this code are found in setupRollovers and in findTarget, which is called from the two mouseover/mouseout functions. Let’s look at each of these in turn. Here, we make all_links a reference to a list of all the <a> tags in the document. However, if the current link doesn’t have any child nodes, this code will cause an error because there is no link.childNodes. So, we must first check that child nodes exist; second, we confirm that there is one and only one child; third, we check whether that one-and-only first child is an image. We can safely assume in the image check that link.childNodes exists, because we’ve already confirmed that that’s the case: if it didn’t exist, we wouldn’t have got this far. This code attaches an event handler to the mouseover event on a node. And this line attaches an event handler to the mouseout event on that node. That’s all! This little function is called by the mouseover and mouseout functions. As we’ll see, they pass event objects to findTarget, which, in return, passes back the link tag surrounding the image that generated the event, if any such tag is to be found. This first part is related to DOM event handling, which is explained in the next chapter. We’ll ignore its workings for now, except to say that it caters for the differences between Internet Explorer and fully DOM-supporting browsers. Once this code has run, however, we should have in our variable target the element that the browser deems to be responsible for the mouseover or mouseout event – ideally the <a> tag. The variable target should be a reference to the <a> tag on which the user clicked, but it may be something inside the <a> tag (as some browsers handle events this way). In such cases, the above code keeps getting the parent node of that tag until it gets to an <a> tag (which will be the one we want). If we find the document body – a <body> tag – instead, we’ve gone too far. We’ll give up, returning null (nothing) from the function, and going no further. These functions work in similar ways and do very similar things: mouseover is called when we move the mouse over one of our rollover links, while mouseout is called when we move the mouse out again. We call the findTarget function, described above, to get a reference to the link over which the mouse is located. If no element is returned, we give up, degrading gracefully. Otherwise, we have the moused-over <a> tag in target. Next, we dig out the image. We also know that the <a> tag has one, and only one, child node, and that’s an <img> tag. We know this because we checked that this was the case when we set up the event handler in setupRollovers. If you look at the code for this modular rollover, you’ll see that it’s divided into parts. The setupRollovers function does nothing but install listeners. The findTarget function does nothing but find the link tag for a given event. The mouseover and mouseout functions do little other than the actual image swapping work. The tasks are neatly divided. That means that this code is good for other applications. We can change the mouseover and mouseout functions to do something else – for example, to make popup help content appear – without needing to start from scratch to get it working. We get to reuse (or at least rip off with minimal change) the other functions in the script. This is not only convenient; it’s also neat and clean. We’re on the way to a better kind of scripting! In the introduction, we referred to the DOM as a critical part of DHTML. Exploring the DOM – being able to find, change, add, and remove elements from your document – is a powerful technique all by itself, and is a fundamental aspect of modern DHTML. Once you’ve mastered the techniques described in this chapter, everything else will fall into place. Through the rest of the book, we’ll be describing techniques and tricks with which you can do wondrous things on your sites, and in your Web applications, using DHTML. They all build upon this fundamental approach of manipulating the Document Object Model. An event is something that happens, be it in real life, or in DHTML programming. But to those working with DHTML, events have a very specific meaning. An event is generated, or fired, when something happens to an element: a mouse clicks on a button, for example, or a change is made to a form. DHTML programming is all about event handling; your code will run in response to the firing of this or that event. Learning which events are available, how to hook your code up to them, and how to make best use of them is a critical part of building dynamic Web applications. (It does seem that there are quite a few "critical" bits, I know!) That’s what we cover in this chapter, along with a couple of real-world examples. Every page element fires a given selection of events. Some events are common to all elements; others are more specific. For example, all visible elements will fire a mouseover event when the mouse is moved over them. A change event, however, will only be fired by elements whose contents can be changed: text boxes, text areas, and drop-down lists. You might have noticed above that I used mouseover, rather than onmouseover, for the event name. Even though the HTML attribute for handling this event is onmouseover, the modern way to describe the event itself is simply mouseover. This allows us to talk about the event (mouseover) and the event handler (onmouseover) separately. The event handler is the location at which an event handler is placed. In the bad old browser days, these concepts were all mixed up, but now we can safely think of them as separate entities. The documents that describe the events fired by a given element are the W3C DOM specifications and HTML recommendations, which were mentioned in the last chapter, as well as the W3C DOM 2 Events specification. There’s also some extra information on key events in the DOM 3 Events specification. 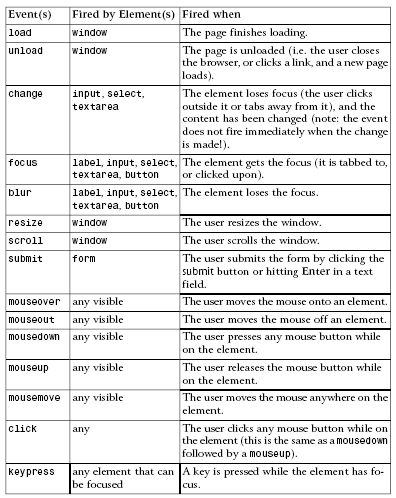 A summary of the events that you’re likely to find useful, and that have cross-browser support, is given in Table 3.1. Note that this isn’t an exhaustive survey: it’s a listing of events that you’re likely to use often, rather than everything under the sun. Click to popup a larger image of this table. So, now you know some common events, and when they fire. But how do you make your code run in response to those events? In this case, how does our aKeyWasPressed function know which key was pressed? Well, it doesn’t. That’s a major limitation of the old-fashioned approach. But we can improve on that! The DOM specifications enlarge the idea of event handlers by providing event targets and event listeners. An event target is the thing at which an event is aimed – an element, essentially. An event listener is the thing that grabs the event when it appears, and responds to it. Where do events come from in the first place? They come from the user. The browser software captures the user action and sends the event to the right event target. Event handling works in different ways, depending on the browser. 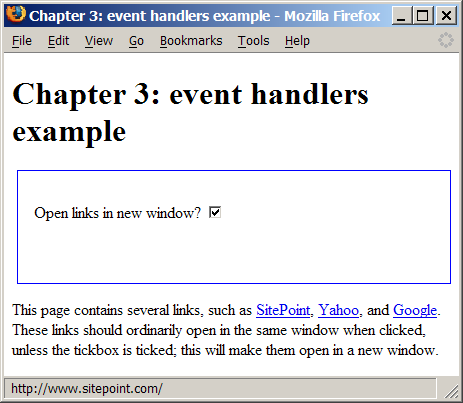 We’ll examine the W3C-approved way first, before we look at event handling in Internet Explorer. Here’s the W3C approach. This is the crucial line that sets everything up. Each element has an addEventListener method, which allows you to hook a function to any event that the element receives. (We’ve used the keyup event here, rather than the more commonly expected keypress, because, at the time of writing, Safari on Macintosh does not support the assigning of keypress events using addEventListener. Perhaps more importantly, the DOM3 recommendation does not mention a keypress event.) The method takes three arguments: the event, the function that should be called, and a true-or-false value for useCapture. This last item relates to a rarely-used feature of DOM events called event capture. For the moment, we’ll just set it to false, to indicate that we don’t want to use event capture. If you’d like to get the full story, see the DOM Level 3 Events specification (not for the faint of heart!). We still haven’t addressed the question we posed earlier, though: how does the aKeyWasPressed function know which key was pressed? A subtle change that we made in the above code was to give the aKeyWasPressed function an argument, e.
When a function is called as an event listener, it is passed, in the case of a W3C events-compliant browser, to an event object, which holds details of the event. This object has a number of properties containing useful information, such as target, and a reference to the element that fired the event. The precise properties that are available will depend on the type of event in question, but the most useful properties are listed in Table 3.2. [a] Don’t use charCode here, even though some Websites tell you to. keyCode has good cross-browser support, and charCode does not. Key codes in the DOM are a standards mess! There are three ways to get the code: keyCode (IE), charCode (Mozilla/Netscape) and data (the official DOM 3 Events way). Fortunately, all major browsers support the nonstandard keyCode. So always use this, at least until the data property is widespread (in about 2010!). The target attribute might not seem very useful; after all, we know that it will be a reference to the <textarea>. But we can hook up the same function as an event listener on more than one element. We can, for example, attach one single function as an event listener for click events to every link in our page. When any link is clicked, our function will be called; we can then tell which link was clicked by examining the function’s e.target. We’ll come back to this in later examples in this chapter. For now, all we need to know is that we don’t have to write a separate event listener for every single tag in which we’re interested. What Happens After an Event Fires? Once the call to topPropagation is in place, the event will occur on the <a> tag only: any listeners on the <p> or <div> tags will miss out. If there are no listeners on those other tags, there’s no need to stop bubbling. In this case, the event silently passes through the parent tags, having no extra effect. In our examples so far, we have handled the keyup event, which is fired when a key is released. As it turns out, this event has no default action. A closely-related event that does have a default action is keypress, which occurs whenever a character is typed using the combination of keydown and keyup. The keypress event is nonstandard (i.e. it is not described by the W3C DOM standard), which is why I have avoided mentioning it until now, but it is well supported by the major browsers. A solution to this problem is to assign event listeners for specific document elements in a listener assigned to the window’s load event. As a result, event listeners will only be assigned once the document has finished loading, and all elements are available. This event is fired once the document has finished loading, to signal that all HTML elements are now available. The addListeners function takes this opportunity to assign listeners to elements as required. We’ll continue to use this structure as we move forward through this chapter, and the rest of the book. Naturally, making events work cross-browser is not as easy as just following the DOM standard. Internet Explorer doesn’t implement the DOM Events model very well. Instead, it offers a proprietary and different way to hook up event listeners and gain access to event data. We’re now using the addEvent function to make aKeyWasPressed listen for keyup events on the textarea. This is not the only change that’s required; we also have to take into account the fact that IE doesn’t pass an event object to our event listener, but instead stores the event object in the window object. Just to make our lives as DHTML developers a little more complex, it also uses slightly different properties on the event object that it creates. These are shown in Table 3.3. Table 3.3. W3C Event Object Properties. [a] 0 = left button; 2 = right button; 1 = middle button. [b] 1 = left button; 2 = right button; 4 = middle button. For combinations, add numbers: 7 means all three buttons pressed. As previously noted, the standard data property is not well supported. If it does, then it and its corresponding window.event.keyCode property, are used to obtain the code of the pressed key. (This technique for checking that something exists is called feature sniffing, and will be explained in more detail in the next chapter.) If not, the event object passed to the function (as e), which also has a keyCode property, is used. Halting bubbling can be done in two ways, as is the case with much event handling: via the DOM approach and the Internet Explorer approach. In DOM-compliant browsers, we can prevent an event from bubbling by calling the event object’s stopPropagation method inside the event listener. Unfortunately, even this doesn’t cover all the major browsers. Arguably a worse offender even than Internet Explorer, Apple’s Safari browser provides the stopPropagation method, but doesn’t actually do anything when it is called. There is no easy way around this, but since event bubbling will not significantly affect any of the examples in this book, we’ll just ignore this problem for now. We also need to feature-sniff to stop default actions. With the DOM, we use the passed event object’s preventDefault method; with Internet Explorer, we set the global event object’s returnValue property to false. Again, Safari appears to support preventDefault, but doesn’t actually do anything when it is called. Unfortunately, preventing the default action associated with an event is a rather vital feature for many of the examples we’ll look at in this book. The only way to do it in Safari (at least until Apple fixes its DOM standard event support) is to use an old-style event handler that returns false. This is actually quite an ugly solution, as it will overwrite any onclick event handler that another script may have installed. This kind of inter-script conflict is what modern event listeners are designed to avoid. Unfortunately, there is simply no better way around the problem in Safari. We’ll see an example of this solution in practice later in this chapter. This sort of cross-browser coding is obviated to a large extent by browser manufacturers coming together to implement the W3C DOM, but for event handling it’s still required. That’s enough about how events work. Let’s see a couple of practical examples. You should also know enough now to fully understand the image rollover code we saw in Chapter 2, The Document Object Model. Some Websites open all clicked links in a new window. Often, they do this with the intention that the user will return to their site more readily if it’s still open in another browser window. Some users find this useful; others find it heartily annoying. It would be possible, given our event-handling techniques above, to give them the choice. Imagine we placed a checkbox on the page, which, initially unchecked, was accompanied by the label Open links in new window. Clicking any link will open that link in a new window if the box is checked. We could implement this functionality using a combination of event listeners: we attach to each link on the page a click listener, which investigates the checkbox and opens the corresponding link in a new window if the box is checked. We also need a listener to run upon page load, to actually attach the listener to each link. <label for="newwin">Open links in new window? Figure 3.1. The example "smart links" Web page. Our code includes the now-familiar addEvent function to carry out cross-browser event hookups. We use it to call the addListeners function once the page has loaded. The addListeners function uses another familiar technique; it iterates through all the links on the page and does something to them. In this case, it attaches the handleLink function as a click event listener for each link, so that when a link is clicked, that function will be called. It also attaches the cancelClick function as the old-style click event listener for each link – this will permit us to cancel the default action of each link in Safari. This is the cross-browser approach to identifying which link was clicked; we check for a window.event object and, if it exists, use it to get window.event.srcElement, the clicked link. Alternatively, if e, the passed-in parameter, exists, and e.target exists, then we use that as the clicked link. If we’ve checked for both e and e.target, but neither exists, we give up and exit the function (with return). Note that we also use toLowerCase on the nodeName of the element. This is the easiest way to ensure that a browser that returns a nodeName of A, and one that returns a nodeName of a, will both be handled correctly by the function. We know that el, the clicked link, is a link object, and that link objects have an href property. The window.open method creates a new window and navigates it to the specified URL. We don’t want the link to have its normal effect of navigating the current window to the link’s destination. So, in a cross-browser fashion, we stop the link’s normal action from taking place. You can see that some of this code is likely to appear in every project we attempt, particularly those parts that have to do with listener installation. A handy trick that many applications use to display tables of data is to highlight the individual row and column that the viewer is looking at; paper-based tables often shade table rows and columns alternately to provide a similar (although non-dynamic(…until paper technology gets a lot cooler than it is now, at any rate!) effect. Figure 3.2. 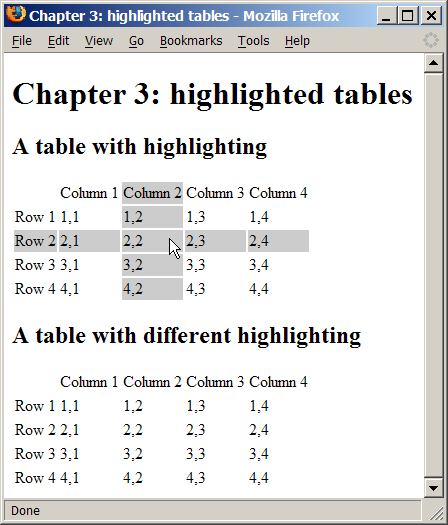 Example of table highlighting in a Web page. We can apply this effect to tables in an HTML document using event listeners. We’ll attach a mouseover listener to each cell in a table, and have that listener highlight all the other cells located in that cell’s row and column. We’ll also attach a mouseout listener that turns the highlight off again. The techniques we have explored in this chapter are at their most powerful when we combine the dynamic capabilities of DHTML with the page styling of CSS. Instead of specifically applying a highlight to each cell we wish to illuminate, we’ll just apply a new class, hi, to those cells; our CSS will define exactly how table cells with class hi should be displayed. To change the highlight, simply change the CSS. For a more powerful effect still, use CSS’s selectors to apply different styles to highlighted cells depending on the table in which they appear. That code creates two four-by-four tables, each with column and row headings (so each table contains five rows and five columns in total). Notice that none of the styles have any effect because, as yet, there are no elements with class="hi". Notice how similar the function outline is to the smart links example. Here are the six items in all their detail. // climb up the tree to the supplied tag. We add our mouseover and mouseout event listeners using the standard approach. The addListeners function sets up our hi_cell and lo_cell functions as mouseover and mouseout event listeners, respectively. To minimize duplicate code, we’ve added a handy little utility function called ascendDOM. This marches up the tree from the element supplied in the first argument to find the first enclosing tag whose name matches the second argument. The rest of the code is simply concerned with picking out the right elements for these lines to work on. Our intention here is to apply the class hi to the other cells in the row that contains the moused-over cell, and its column. The first line above executes the first task. The second line applies the class to a given cell, but our script needs to find the appropriate cells first. This is where things get a little complicated. The row is a simple <tr> tag, whereas the column is a list of cells scattered across all the rows in the table. According to the DOM Level 2 specification, table cell elements have a cellIndex property, which indicates the cell’s index in the row. To find the other cells in this column, we could iterate through all the rows in the table and find within each row the cell that has the same cellIndex. All the table’s rows are held in the table’s rows array. We walk through that array, applying the hi class to the cell in each row that has the same index as the moused-over cell. The upshot of this exercise is that all the cells in the same column as the moused-over cell will have class hi; the table row containing the cell will also have class hi. Since a className is a string, it has all the methods of a string, one of which is replace; we can call the replace method with a regular expression (first parameter) and a substitute string (second parameter). If a match for the regular expression is found in the string, it is replaced by the substitute string. In our example, we look for matches to the expression b ?hib (note that regular expressions are delimited by slashes, not quotes) – that is, a word boundary followed by an optional space, the word ‘hi’, and another word boundary – and replace it with a blank string, thus removing it from the className. As a result, the highlighted cells in that particular table will be highlighted differently. CSS makes achieving this kind of effect very easy. Understanding the processes by which events are fired, and by which code is hooked to those events, is vital to DHTML programming. Almost everything you do in DHTML will involve attaching code to events, as described in this chapter. We’ve examined some common events and the two browser models for listening to them. We have also covered what happens when an event fires, and how you can interrupt or alter that process. Finally, we looked at a few events in detail, and saw some simple examples of how code can attach to those events and improve the user experience on sites that employ these techniques. You just listed all my best features. Offer complete DOM support without bugs. The three categories in the middle of the list are of concern to us in this chapter. Here, we’ll explore how to identify which DHTML features are supported by a given browser before we try to utilize those features in running our code. There are basically two ways to working out whether the browser that’s being used supports a given feature. (Actually, there’s a third way to identify browser support. The DOM standards specify a document.implementation.hasFeature method that you can use to detect DOM support. It’s rarely used, though.) The first approach is to work out which browser is being used, then have a list within your code that states which browser supports which features. The second way is to test for the existence of a required feature directly. In the following discussion, we’ll see that classifying browsers by type isn’t as good as detecting features on a case-by-case basis. Why am I so unenthusiastic about browser sniffing? There are lots of reasons. Some browsers lie about, or attempt to disguise, their true details; some, such as Opera, can be configured to deliver a user agent string of the user’s choice. It’s pretty much impossible to stay up-to-date with every version of every browser, and it’s definitely impossible to know which features each version supported upon its release. Moreover, if your site is required to last for any reasonable period of time, new browser versions will be released after your site, and your browser-sniffing code will be unable to account for them. Browser sniffing – what little of it remains – should be confined to the dustbin of history. Put it in the "we didn’t know any better" category. There is a significantly better method available: feature sniffing. Which DOM Features Should We Test? The easiest approach is to test for every DOM method you intend to use. If your code uses getElementById and createElement, test for the existence of both methods. This will cover browsers in the fourth category above: the ones that implement some - but not all - of the DOM. It is not reasonable to assume that a browser that supports getElementById also supports getElementsByTagName. You must explicitly test for each feature. Where Should We Test for DOM Features? This script contains a myScriptInit function, which sets up myScriptEventListener as an event listener. But, before we set up that listener, we check for the existence of the DOM methods getElementById, getElementsByTagName, and createElement. Figure 4.1. The thumbnail display implemented by the scrollImage example. We'll describe what's going on here in a moment. We'll review the code first, then see a demonstration before we get to the explanation. We'll explore (and fix!) this code shortly. Finally, the page also contains images: five at full-size, and five thumbnails. You can find them in the code archive for this book. Let's see how the page works. 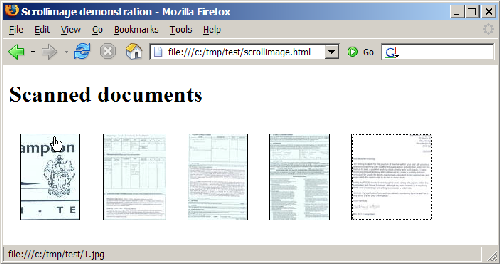 The HTML document shows five images as thumbnails; in this example, they're thumbnails of individual pages of a scanned-in document. Figure 4.2 shows the page content under normal circumstances. Figure 4.2. Thumbnails of a document. When we mouse-over a thumbnail image, though, the display of that thumbnail changes to show the actual image to which it's linked, as shown in Figure 4.3. The thumbnail becomes a viewing area in which we can see a snippet of the full-size image. As the cursor moves over the third image, we see the content of the third image at full size through the viewing area. For a document thumbnail such as this, we can use the cursor to move around the document within the viewing area, so that we can read the content and see if it's the document we want. This technique can also be useful, as mentioned, in photo galleries containing images that look similar when displayed at thumbnail size. Figure 4.3. Mousing over a thumbnail. Failing that, we look for Internet Explorer's proprietary attachEvent method on the object. Failing that, we attach the event listener directly to the element, as an event handler; this is required for IE5 on Macintosh. This procedure caters for all the ways by which we might attach an event listener, using feature sniffing to see which option is available. If the user’s browser doesn’t support document.getElementsByTagName, then we return from the scrollInit function and don’t progress any further. This is a compressed, shorthand version of the code we saw in Chapter 3, Handling DOM Events. In theory, e.clientX and e.clientY give the x- and y-coordinates of the mouse within the browser window, respectively. By subtracting from these the x- and y-coordinates of the target element, we obtain the mouse’s position within that element. Depending on your browser of choice, this might seem to work just fine at first glance. Peter-Paul Koch’s findPosX and findPosY functions make short work of getting the target element’s position. (For a complete description of how findPosX and findPosY work, visit Peter-Paul Koch’s page on the subject.) Unfortunately, the clientX and clientY properties of the event object are nowhere near as reliable. The code above is flawed: the event listener uses e.clientX and e.clientY to ascertain the position of the mouse. But that’s not a flaw, is it? After all, it’s in the DOM specifications! So, we need to use pageX and pageY if they exist, and clientX and clientY if they do not; if we’re in Internet Explorer, however, we have to add to clientX and clientY the amounts by which the page has been scrolled. But how do we know if we’re in Internet Explorer? We use browser detection. That spluttering noise you can hear in the background is the crowd rightly pointing out that we consigned browser detection to the dustbin of history only a few pages back, and they’re not wrong. However, there are occasions when different browsers implement the same properties (in this case, clientX and clientY) in different ways and when there are no other objects available for sniffing that can us tell which of the different implementations is in use. Note that, first, we check that window.opera is false or non-existent; Opera sets this variable to make it easy for scripts to detect that it is the browser in use (Opera also implements user-agent switching, so that, from a navigator.userAgent perspective, it can appear to be Internet Explorer). Once we’ve established that we’re not using Opera, we go on to look for "MSIE" in the user agent string; if this is present, Internet Explorer is the browser in use. Note that we check first for pageX and pageY (for Mozilla), then fall through to clientX and clientY. We handle Internet Explorer by checking the isIE variable; if it’s true, we add the document’s scroll amounts as required. We’re using the browser detect as little as possible; specifically, Netscape/Mozilla provide the pageX and pageY properties, and we look for them through feature sniffing, not by performing browser detection for Mozilla. The last section of our code has little to do with browser detects, but, having spent all this time to get the right X and Y coordinates, it makes sense to understand how to use them. Code like this is liable to be specific to each DHTML effect you undertake, but the mind-bending you have to do to come up with the code is similar in all cases. Take a deep breath: here we go! With the large background image showing through the viewing area, what should appear when the cursor is in the top-left corner of that viewing area? The top-left corner of the big image should be in the top-left corner of the viewing area: that’s straightforward. Now, what should appear when the cursor is located at the bottom-right corner of the viewing area? Should the bottom-right corner of the full-sized image be in the top-left corner of the viewing area? That’s what would happen if the big image were moved by its full size across the viewing area as the cursor was moved the full distance across the viewing area. Think about it carefully; you might like to try experimenting with two pieces of paper, one of which has a rectangular hole in it. The big image would eventually disappear off the top-left corner of the viewing area! If the background image were tiled (the default), additional copies of the image would be visible at this bottom-right corner – a very odd result. We don’t want the image to move that far. If we move the cursor to the extreme bottom-right of the viewing area, we want the big image to move by almost its entire size – but not quite! We want the bottom-right corner of the big image to move only as far as the bottom-right corner of the viewing area, and not move any further towards the top-left. Now, to make the big image move, we have to calculate a distance by which to move it. Take some example figures: suppose the big image is ten times the size of the thumbnail. Let’s suppose the image is 500 pixels on each side, and the thumbnail’s 50 pixels on each side. For every pixel by which the cursor moves, the big image should move 500/50: ten times as fast. So the "scale factor" is ten. But, wait a minute! If the cursor moves 50 pixels left, the big image will move 500 pixels left: right off the left edge of the viewing area. That’s too far. We want it to move at most 500 minus 50 pixels, so that it’s always "inside" the viewing area. Therefore, the real scale factor is (500 â€“ 50) / 50 = 9. The full-sized image should move nine times as fast as the cursor. That’s what the first set of calculations does, except that it calculates scale factors in both dimensions, since most images are rectangles, not squares. Now, if (for example) we move the mouse from the top-left towards the bottom-right, we’re scanning diagonally across the viewing area. As we move, we want new areas of the big image to come into view. So the big image had better slide in the opposite direction to the mouse: up towards, and beyond, the top left. It’s like using a negative margin to bleed text to the left and top of a page. And that’s what we do by calculating negative pixel amounts. This idea may seem back-to-front initially. Think of it as though you were shooting a scene for a movie. The camera (the thumbnail viewing area) is fixed into place, so it must be the scene at which the camera points that moves if there’s to be any panning effect. Alternately, imagine yourself looking out of the window of a moving train without turning your head. It’s the same effect again, provided the train goes backwards! In this chapter, we’ve learned that browsers don’t always support all the DOM features we’d like, and discussed how feature sniffing helps us as DHTML developers to code defensively around this issue. Browser sniffing allows us to deliver dynamic features to browsers that can handle them and, at the same time, to avoid crashing or throwing errors in browsers that can’t. We looked at the old method, browser sniffing, and explained why it shouldn’t be used if at all possible. We then explored one occasion on which feature sniffing can’t provide everything we need, leaving us the old method as a last resort. Stuart Langridge has been a Linux user since 1997, and is quite possibly the only person in the world to have a BSc in Computer Science and Philosophy. Heâ€™s also one-quarter of the team at LugRadio, the world's premiere Free and Open Source Software radio show. Tony Steidler-Dennison is a Systems Engineer with Rockwell Collins, Inc., designing avionics and cabin data servers for commercial airliners. Heâ€™s also the host of The Roadhouse Podcast, "the finest blues you've never heard."